Mary logs her recent experience with breast cancer. I decided to log my experience. I began my log soon after my first lumpectomy–waiting in pre-op had driven me nuts. I couldn’t watch tv or talk to my good friend Judy who was there to hold my hand, and, as it turned out, be my witness to events no one believed until we both swore they happened. So when it turned out I needed a second lumpectomy plus the removal of who knew how many underarm nodes, I bought something to write in. It turned out that writing kept me calm. I just went on and on describing what was happening, what I was hearing, feeling, fearing, and otherwise dealing with. It was a lifesaver for me. So find here my story. It may take me some time to write it all down, but I was so hungry to find answers to my many questions, and the experience was for me so full of surprises and unexpected challenges, that I thought I might share it here. If you know someone who might find it interesting or beneficial, please clue them in. Mary finishes art for What’s In the Woods? 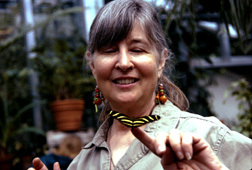 Mary is close to finishing the critters and other wonders found in the woods around our wonderful Great Lakes. Last time she worked in acrylics (What’s On the Beach, 2003). This time she’s used watercolors for a softer, woodsy look.